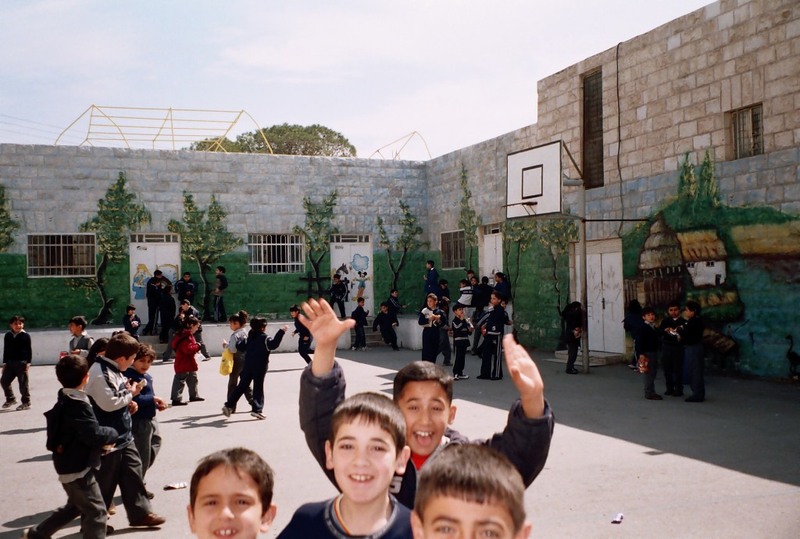 Situated in the south area of Zarqa, the poorest part of the city, the schools’ pupils come mostly from the ‘refugee camps’ in the surrounding area. The camps now consist of permanent, low quality buildings. They were well established before the foundation of the parish in 1949. The majority of the families cannot pay the fees because either they are unemployed or have a very low income. At first the school consisted of three classrooms divided by partitions, which were removed for the weekly Mass. With the building of the new church, the partitions became permanent walls giving three classrooms for the lower grades. The accommodation for the Rosary Sisters is now above these rooms. The school was extended in 1979, with the financial aid of the Lieutenancy of Canada Montreal. At the same time a multi-purpose hall was built, which has a large stage useful for entertainment, meetings and other functions. Later, in 1998, classrooms were constructed in the basement of this building. They provided four rooms for the Kindergarten with a good outside play area, part of it giving cover in wet or extremely hot weather. 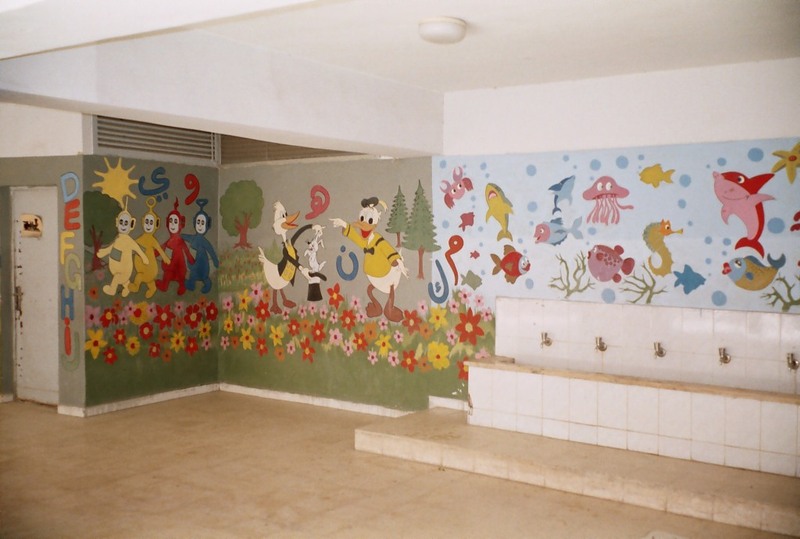 The walls of this area have been decorated with murals of trees and countryside, painted by an artist from Iraq. There is an enclosed sandy area with three pieces of rather old plastic climbing equipment. The outside walls of the main school buildings have also been decorated with large murals of trees etc. The school now has eleven small classrooms. With an average class size, in every grade, of 30 and above they are always overcrowded. The 18 computers in the laboratory always have to be shared between at least two pupils. In the Science laboratory only a small amount of equipment exists, and the Library has an insufficient number of books. On the staff of one Principal with 15 all female teachers, there are also two Rosary Sisters for the teaching of Religion and parish work, three Administrative Assistants and two Kindergarten teachers. They are all Christian except for one Muslim. The Kindergarten also has a room where children can watch television or videos at the end of the school day. Opposite is a Consultation room, with a teacher employed specifically for the purpose of counselling. Many of the children are experiencing the various problems, psychological or otherwise, caused by the disturbed and traumatising times and places where they have lived and are growing up. In 1998, when the basement was converted, central heating was installed in the corridors and classrooms. This is the only permanent heating in the school during the very cold period of the year, the remaining rooms having to use portable gas heaters. After grade 9 the students either go to government or private schools. Much depends on whether their parents have sufficient income to pay the fees. Most parents cannot afford the fees, even for the Patriarchate school. In order to develop social skills, the pupils take an active part in events and competitions with other schools in the city. They are also taken on visits to other parts of Jordan, such as the Dead Sea and places of educational interest. Some children, who have the capability, attend classes in a nearby government school for extra tuition in mathematics.